Hallo Nyjah, introduce yourself please and tell us when and how you started BJJ? My Name is Nyjah Rollins, formally known as Nyjah Easton. I starting training BJJ when I was 16 years old, after I began working at Lloyd Irvin’s MMA summer camp as a striking instructor. After 10 years of Tae Kwon Do experience, I decided to further my learning after my eldest brother, UFC veteran, Mike Easton held me down to prove that learning ground self defense was just as important as striking. I was reluctant to start but after a few short weeks found BJJ both fun and very different from my previous martial arts training. I still believe I was the “worst white belt ever” lol But my instructors were very patient and dedicated to my success as a BJJ practitioner. What do you like more about this sport? What I love most about BJJ is the personal challenge! It teaches you to remain calm and to think in some of the most difficult situations. Through my practice of BJJ I have been able to transfer my thoughtfulness to other areas of my life. I often think and say to myself “yes I’m in a really tough spot, BUT its only a matter of time before I’m out and in my most dominate position. There have been several instances in my life that this type of thinking has helped me through some of my most challenging times. In addition to the challenge, I also love the creativity BJJ invites. Each person has their own unique style and expression of BJJ, and I think that pretty awesome. And when did you become mum? What did you feel when you found out that you were expeting twins? Describe us the moment! I found out I was going to become a mom just a few months after I was married. My first doctors appointment revealed I was pregnant with twins. I was in total shock and it didn’t really sink in, until I was almost 5 months pregnant. I sat in the doctors office with my husband and my mom in disbelief what the doctor had just shared. As excited as I was, I was also a very nervous. My entire life has been dedicated to training martial arts, with the last 12 being BJJ specific. I wasn’t sure how my life would change, but I knew becoming a mom of twins would change my life tremendously. My twin girls, Paityn Jo and Lailah Rose, are now very active and busy 15 month old toddlers. They truly are one of the best gifts I have ever received. Did you train while you were pregnant? I trained up until I was about 8 months pregnant. I worked out regularly, continued to teach my BJJ classes, and would do drills and light sparing weekly. I honestly believe I was able to carry my twin girls full term, have a natural delivery and be back active again just a few weeks after the girls because of my BJJ training during my entire pregnancy. Have you started to train again? 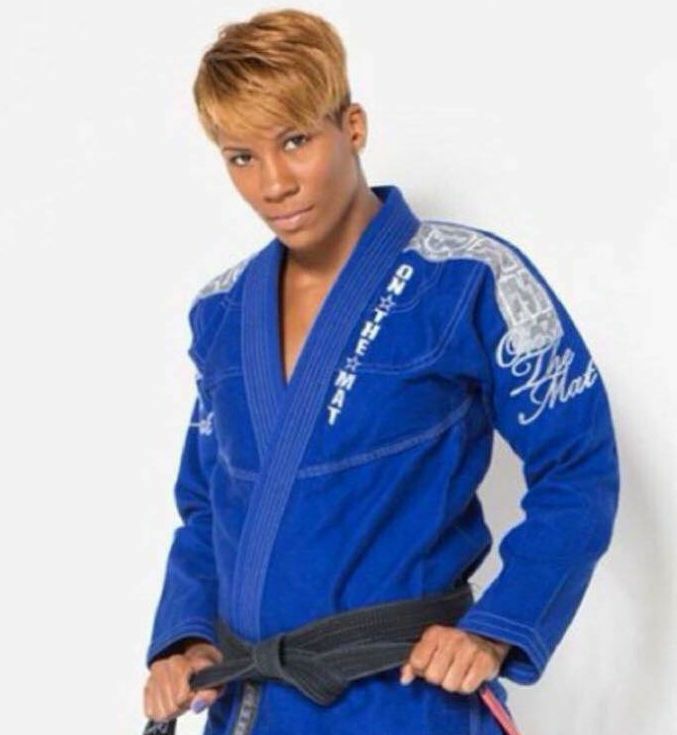 I started training as soon as I was clear to workout again, my first day back was actually when my teammate AaRae Alexander earned her black belt. It had to be over 50 people on the floor and everyone was fresh off of the world championships, so you could imagine how “hype” the training mats were. I was nervous I was going to feel terrible and would get mauled over, but to my surprise I hadn’t lost much. Now my transitions were slower, my closed guard didn’t exist, and my cardio was only good for 6 minute rounds, but I was back on the floor and felt great. Some mums find difficult to keep training when they have kids. They don’t know how to combine motherhood and training. Your case it is a extreme one since many women have two or even more kids, but it doesn’t happen so often that you get them at the same time! How you do it? Who helps you? Kudos to all the mamas out there balancing motherhood, working and BJJ! It really takes a lot of planning and will power to keep training consistently. To be honest, after your done changing dozens of poopy diapers, nursing on demand, and soothing a sleepy baby, you want nothing else than to jump in the bed. It’s tough, and to be honest I am still learning how to balance it all. I am now also a lead 7th grade math teach at KIPP DC and my days are now spent teaching students math. Most days I’m not home from school until 6 pm and most classes start between 6 and 7 pm. This time struggle is what makes the times I do have for training so special and important to me. My family is very supportive and between my husband, parents, and in laws, I have a full team of on call babysitters. Now that the girls are busy little toddlers , containing both of them in the gym requires a team mate (or two) to fully dedicate to keeping the girls off the mats! Does your husband also do BJJ? Does he support your training? My husband, Joe, is also a long time practicing martial artist. Since the age of 7 he’s trained in MMA and is currently the GM for several of the DMV I Love Kickboxing studios. He is very supportive of my training and has even been a regular training partner for me when in competition training camps. I am a also mum of two, 7 and 3, and have encountered many challenges. I can’t even imagine if i had twins. What has been the most difficult thing you have endured so far? To be honest, my girls are amazing and it’s hard to really pin point one thing that has been most difficult for me as a new mom. Of course the initial sleep deprivation and physical challenges you face as a new mom are challenging but I’ve enjoyed every moment. The hardest thing about being a mom and an active athlete is balancing time. 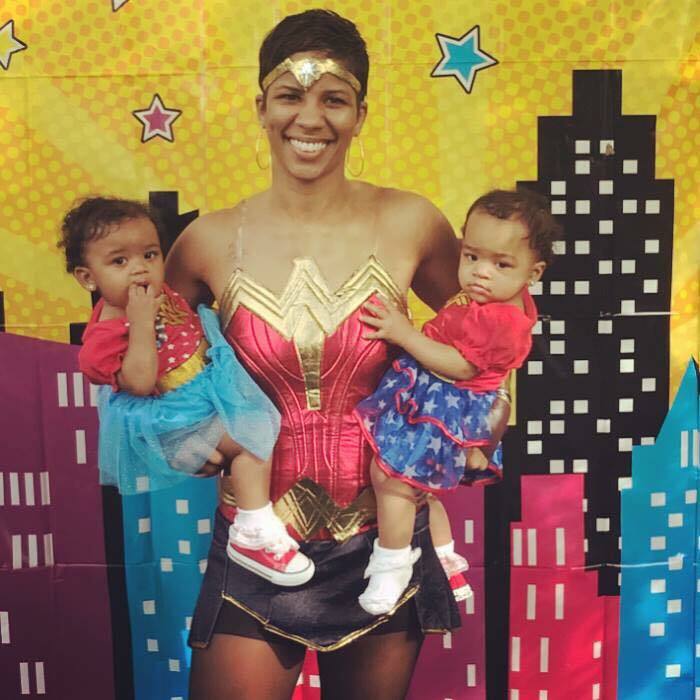 When I found out I was pregnant with twins I was traveling and competing around the globe, had just gotten married a few short months before, and my only focus had been to become a Black Belt World Champion. I was even more nervous with the idea of having not one but two babies and thinking how would I balance it all and would I ever be able to continue to pursue my passion of competing in BJJ. It’s still a work in progress but I’m learning every day. I have an amazing village around me that’s very supportive and knowing that, I am sure I will back in action and on the podium soon enough! Which are your coming future plans? I currently train on the weekends and when my team mate, AaRae Alexander needs additional work to prepare for tournaments and super fights. I plan to return to the competition scene at the start of 2018 and will be competing at several major tournaments. 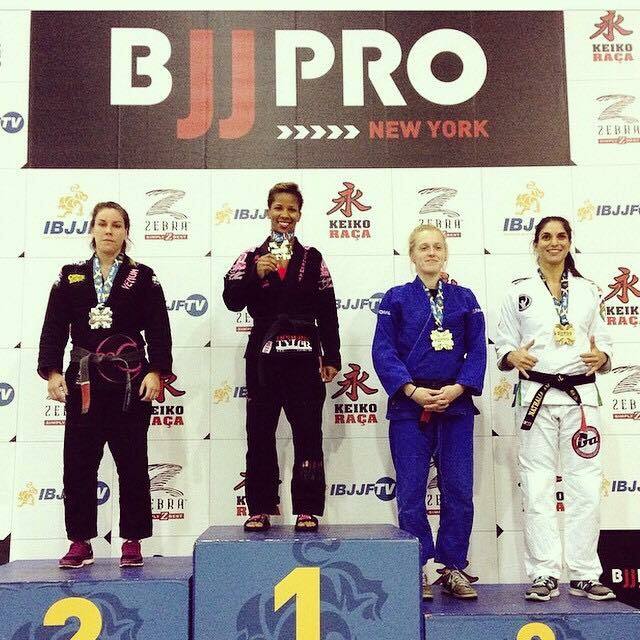 I am beyond excited to get back out there with the other BJJ female warriors and continue to pursue my passion! Anything you would like to tell the BJJ Mums community out there? You are amazing!!! 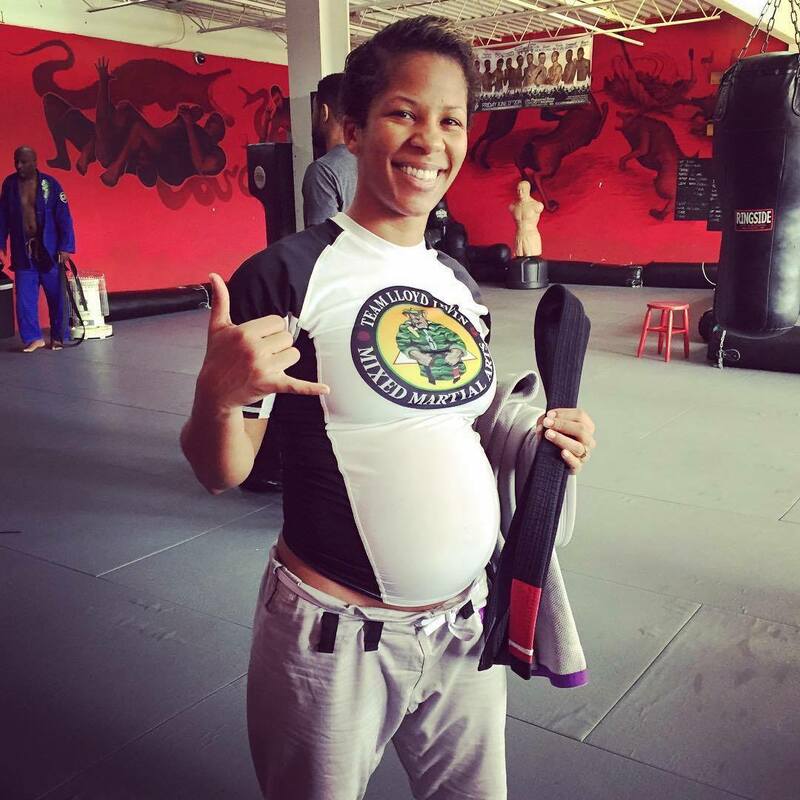 As a new mom, I have an entirely different respect for the mama’s out here raising a family and still managing to get in regular BJJ training. It takes a lot of dedication and passion to that! Kudos!